I have been a part of Bridge to Skate organization for about three years now and it has been by far the best experience I’ve ever had! BTS has always been there to help me with anything I needed. I was raised in a sketchy neighborhood and my parents weren’t the wealthiest people but they tried their best to give me as much as they could. Where I’m from there are a lot of gangs and people who do drugs. Skateboarding was my escape from all the negative vibes. I first heard of BTS from a friend back in high school who was already involved with Bridge to Skate. He invited me to their free monthly competition. I was a very shy kid who loves to skate. I remember showing up and I didn’t know anyone except my friend who invited me. He introduced me to Chantelle Heroux. I remember asking her if I can get involved with BTS and she said yes. Afterward, Chantelle invited me to my first outing on Thanksgiving Day. 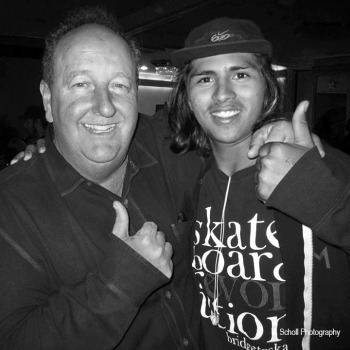 That day was the first time I ever met and hung out with a pro skater. I had such a great time with them. We ate a wonderful dinner and Chantelle even gave us our own element skateboards. I couldn’t really believe it, it was a blessing. After that day I started doing my own things and stopped hanging out with kids that would get me into trouble. BTS started taking me and some of the locals from Watts and South Central to outings and trips such as “Skate for a Cause” in Lake Forrest and “U.S. Open of Surfing” in Huntington Beach. Our family continued to grow as more kids got involved. If it wasn’t for BTS and skateboarding I’m sure I would have been a high school dropout. Being a part of BTS made me feel like I had to do whatever I could to graduate high school. I didn’t graduate on time but I still managed to pull through in the end. I want to thank Chantelle Heroux, Manny, Norma, Neal Hendrix and the rest of the Bridge to Skate family for being so great with me and for making most of my dreams come true.